Hawaiʻi Island police are asking for the public’s help in identifying a man wanted for assault in connection with a road rage stabbing incident in Puna. At 3:29 p.m., Wednesday afternoon, (November 22), a 25-year-old Pāhoa man told police he was stabbed in the chest by the driver of a light-colored sedan following an argument on Moho Road, (Road 8), in the Hawaiian Acres Subdivision. The victim was driven by private vehicle to the Pāhoa fire station, then taken by ambulance to the Hilo Medical Center where he was treated and released. Police recovered the knife suspected to have been used. 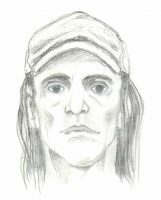 Police are releasing a composite drawing of the suspect who is described as a Caucasian man in his 40’s, about 6-feet tall, weighing 170 pounds with shoulder-length blond hair. He was last seen wearing a gray or white t-shirt, blue denim shorts, and black slippers. The suspect’s vehicle is described as a light colored Nissan Versa that was last seen driving in the Pāhoa direction on Moho Road. Anyone who recognizes the suspect or who may have any other information about this incident it is asked to call the Police Department’s non-emergency line at (808) 935-3311 or Detective Tuck Loy Aurello of the Area I Criminal Investigation Section at (808) 961-2385 or Tuckloy.Aurello@hawaiicounty.g….